Vintage has exploded onto the High Street, as many magazines will claim, but has it REALLY? Are these cheaply made reproductions really worth the prestigious title of Vintage, or should they only be allowed to use the name if the quality matches the authenticity of the real thing? Personally, I think shops should only use the title of 'Retro' to describe reproductions, don't we see enough of them in my personal hate Primark? Only a couple of years ago, I came across a dress from Topshop which had an identical pattern to one in Prim Vintage, Norwich, if anybody has a photo of the modern version, please add a comment with a link! I like Oasis, their clothes are very high quality and when they do their Vintage collections, it is obvious that they really study the originals to capture the authenticity. 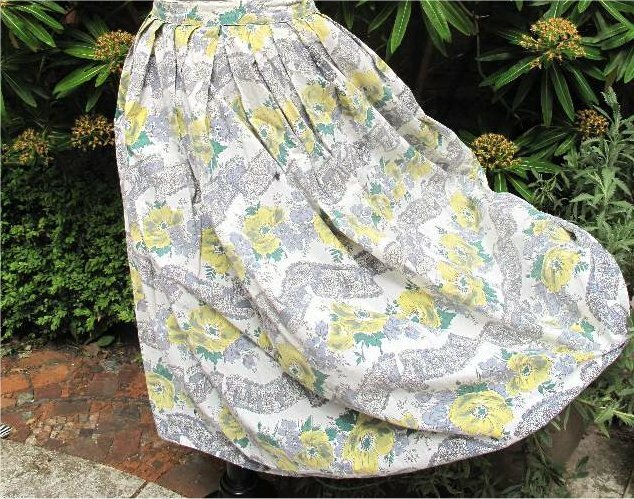 For example, Oasis' Some Day My Prints Will Come Collection for Spring/Summer 2012 is based on original vintage pieces from SecretSiren.co.uk. The collar on this cardigan is frilled slightly and the buttons are quite dainty, making it look very vintage, although D.P simply titles it as 'Lemon Scallop Cardigan' and even better, it's available in a variety of colours! A real bargain at £18! Miss Selfridge is known for its gorgeous selection of embellished dresses, boleros and generally exciting clothes, but for Vintage lovers, it also provides some of the best retro wear as well. Who can forget the sell out Victorian boots which graced the shelves back in December 2010? How much did I want these shoes? Well...a lot. Fortunately I managed to get a pair from Office in the sale which are very similar and I think may be better quality!!! They were a bit more expensive even if they were in the sale!!! I seem to have a thing for yellow! The collar on this is really dainty, but the material is almost jersey making it very tight however in terms of Miss Selfridge's current trends, this is on the most appealing side. It's pretty without being too modern, whereas most of the dresses in store at the moment are very...unusual, to put it kindly. This is really one of a kind in terms of what styles they have to offer and vintage girls will like it! Apart from that, not much is available if you like authenticity, although the Winter collection was very preppy and retro! 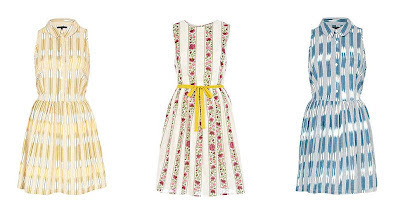 I refused to enter a River Island store for years until I saw their Chelsea Girl range and the release of their Peggy Olson-esque check dress in 2010, prior to that I considered their clothes to be very mainstream and dull with neon prints and awkward styles. Recently I made a few purchases and realised that perhaps River Island isn't as bad as I thought for the vintage girl. One of my pet hates is when shops refer to normal length 50s style dresses as Prom dresses. THEY. ARE. NOT. 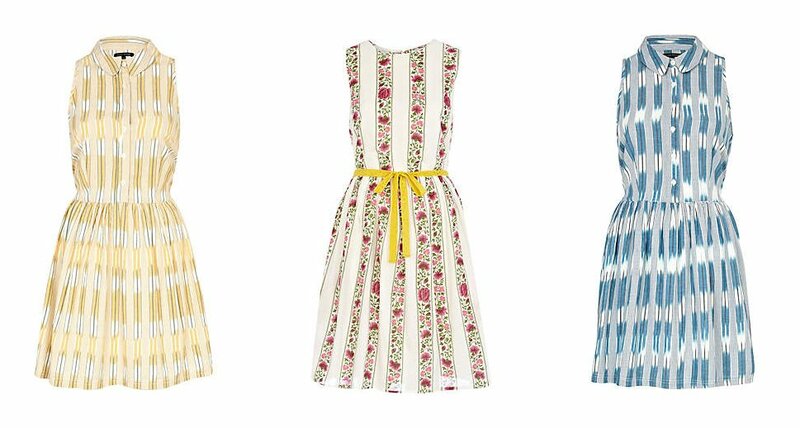 To the vintage girl, these are simply reproductions of the type of dresses she normally wears and therefore should have the tag line of 'prom' stripped to make them less 'occasion' and more 'everyday!' River Island does not classify its items as vintage, only retro, and has recently moved to producing some decent versions of originals, 50s style crop tie-tops and shirt waisters (to you and I) but 'shirt dresses' to those not familiar with vintage. TopShop is one of those shops which tends to flit in and out in terms of vintage. Their 50s Diner collection for Spring 2012 was a very poor attempt at capturing 50s Americana. Pastels, yes, I can kind of get the whole 'pretty pastels' thing, but since when did the 50s do crop tops with a netted maxi skirt? The 50s Diner look was just wrong, wrong, wrong apart from the colours. Actually, let's just move on. TopShop have some concessions which are good for vintage style, particularly in their Oxford Circus megastore, but in general seem to be more interested in producing mismatch than good fashion. But hey, that's only my opinion. At Dorothy Perkins there are many midi dresses, but this one from concession brand 'Paper Dolls' really captures the 50s to a T.
Team with a pair of red heels and a cute vintage clutch bag! But haven't I seen this before...? Well...not quite, but could be. I'd love to put some patterns on this, it does look a bit plain, but I suppose that is the effect. Those are my picks of the High Street!